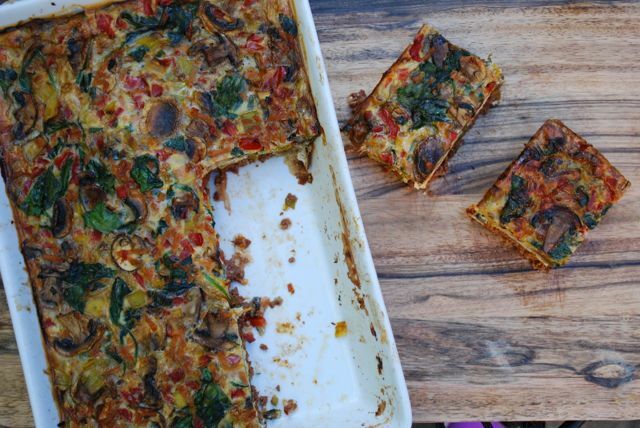 Paleo Quiche + Meat = Meache Recipe. Before we get into our Paleo Quiche aka Meache Recipe we wanna talk workouts and pushups! Our new gym program has been rockin’ this week and oh my, are we feeling it (waking up and rolling out of bed sore…yeeha!) Change = good…actually the best. The end of our shoulder/back program is to do three sets of push ups (on our toes, thank you very much) to failure. Holy moley…helloooo shoulders and chest! Push ups are definitely an underestimated and sometimes forgotten exercise. With all of the shiny, pretty and interesting looking equipment in the gym, it is easy to forget how simple a work out can be. The benefits of push ups: you can do them anywhere (that’s right, there are no excuses when it comes to push ups), they work out almost every muscle in the body and they work up a sweat! These simple little buggers scream: ultimate workout! So next time, add a little something extra to the end of your workout: three sets of push ups to failure, trust us on this one, you will be feeling it the next day! Today we have the perfect post-(push up)-work out meal…inspired by PaleOMG, it’s a meat base quiche…A MEACHE! P.s push ups have been a test of strength and fitness for years and years and it’s pretty impressive when you can drop down and give anyone 20 without a thought. What are you waiting for…drop down and give us 20! Mix all of your base ingredients together in a bowl. Once combined, press the mixture into the base of a large casserole dish (around 30cm x 20cm). Make sure the meat base is even and firmly pressed down. Place the base into the oven for 15 minutes. Meanwhile, heat a little coconut oil in a hot pan. Place the sweet potatoes into the pan and fry them up until crispy. Your meat base should be done by now (it doesn't need to be completely cooked as it will go back into the oven). There may be a little excess oil, carefully pour this out. Place the sweet potatoes over the meat base, covering it evenly. Sprinkle the capsicum over the sweet potatoes, followed by the zucchini. In a bowl combine the whisked eggs and milk. Now pour the egg mix over the meat and veggies. Place back into the oven for a further 25 minutes. Cut into slices and serve with mashed avocado. This dish can be served right away but it's equally delicious for leftovers: cold or hot.